I'm typing this from Linux Mint 17.3, while running WSPR. 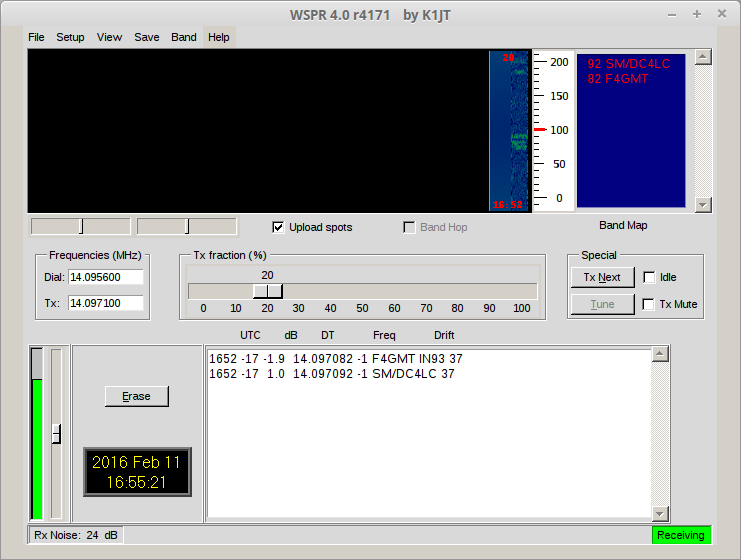 It was quite easy to install the Windows version of WSPR 4 using Wine. The only problems were no choice of sound devices (I have both internal and USB audio, often a different radio application is using each one) and the list of serial ports for CAT control of the radio still showed COM1 etc. which don't exist in Linux. I think these can be set up to use the proper device but I just chose VOX to transmit. When I was installing Linux Mint I chose to install it alongside Windows, and it installed itself on an external USB HDD (with the boot menu on the internal HDD). You can see on the screenshot where I had to turn the input level up from its default of 0. It still managed to decode 2 stations with only half the time slot though.